When, someone says the word “most beautiful lakes”, what comes to your mind? Something very attractive, out-of-this-world, panoramic backdrop with mesmerizing sunset, towering mountains bordering those lakes and more beauty add-ons may strike your mind. Imaginably it’s the small pond behind your childhood home or from tiny grass-lined ponds to extra-large freshwater expanses easily mistaken for oceans. The water of these lakes are most endearing and have lovable qualities, whether its ripples or mirror-like reflections, shadows of trees, mountains falling on it, or the crystal clear water of these beautiful lakes stun your eyes. This incredible list won’t let your eyes to blink after seeing the beauty of these amazing lakes from all around the world. This Crater (hole filled with water) is found after the monsoon at the top of Mt Pinatubo; an active volcano in the Philippines. 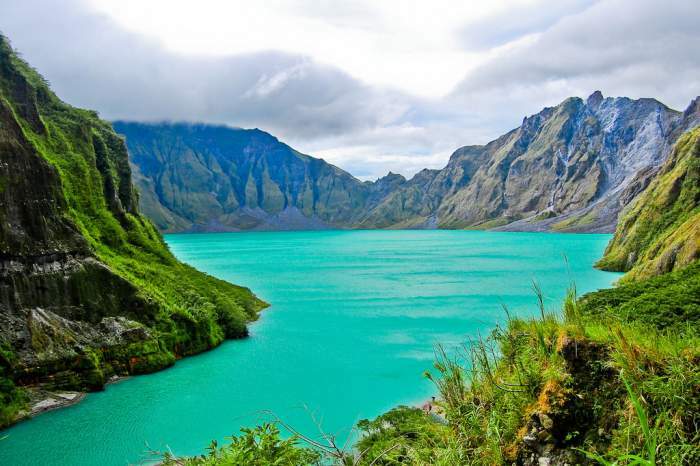 Lake Pinatubo was formed back in 1991. Nearby Attractions: Miyamit Falls, Aqua Planet, ATV Petrohead. When you talk about beautiful places in the world, Iceland always tops that list. This dreamlike landscape, breathtaking natural wonders are just a few of the reasons behind Iceland’s beauty and its magic. 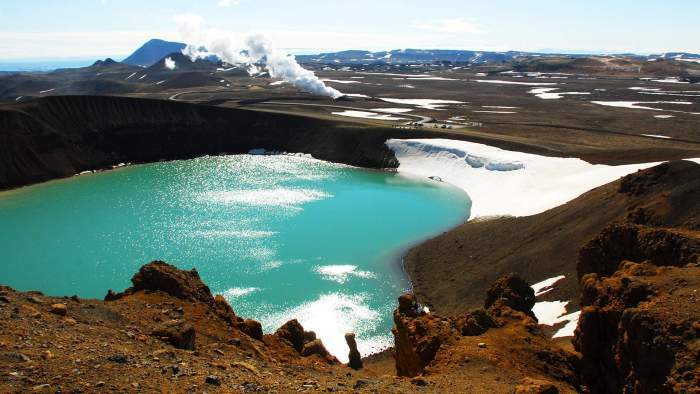 Viti Lake is one of that natural wonder, in Northern Iceland, which was formed inside a circular crater. The lake is all glittering with blue water, surrounded by colorful and marvelous mountains and a geothermal area, creating an illusionary landscape. Nearby Attractions: Krafla Lava Fields, Namafjall, Myvatn Nature Baths, Dimmuborgir Lava Formations, Lofthellir Lava Cave, Lake Myvatn, Hverfjall. Talking of incredible sceneries and not mentioning Canada? It’s a big NO NO. Lakes are the striking features whenever a picture of fantasy hits our mind. 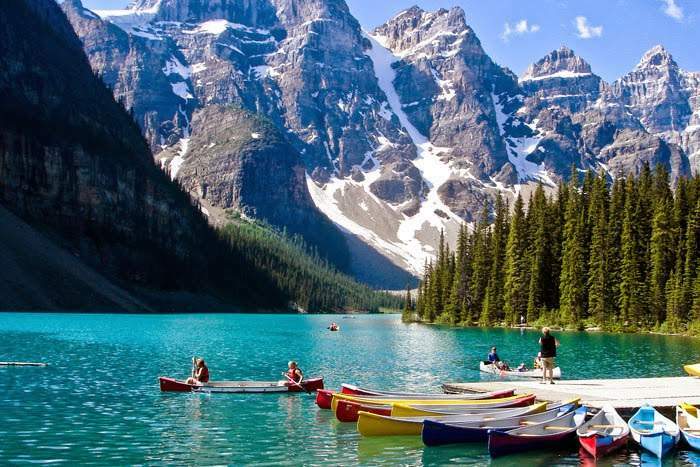 In the city, this jaw-dropping lake is located in the Banff National Park. Lake Moraine is such a beauty that in 1969 and 1979, that it has been featured on the backside of the issues of the Canadian Twenty Dollar bill. It is a frosty lake located in Banff National Park, in the rocks of Canada. 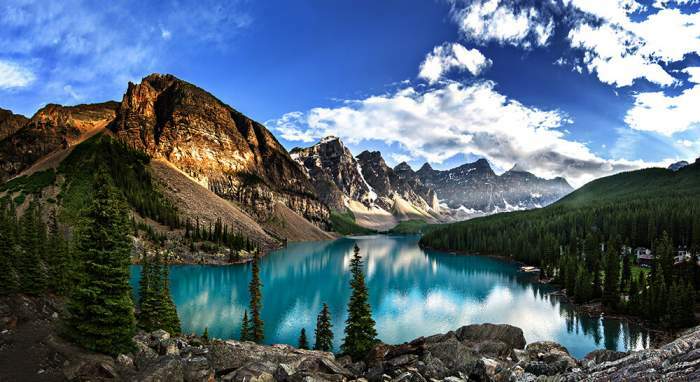 Having an altitude of 1,884 meters (6,181 feet) in the Valley of the Ten Peaks, Moraine Lake gives you an incredible view of the Mount Fay, Wenkchemna Peaks, Mount Allen, Mount Bowlen, and Mount Babel. Nearby Attractions: Sentinel Pass, Wild Water Adventures, Plain of Six Glaciers, Big Beehive, Fairmont Chateau Lake Louise, Lake Louise, Bow Glacier Falls Trail, Lake Agnes, Lake O’ Hara, Valley of the Ten Peaks, Temple Mountain, Mirror Lake. 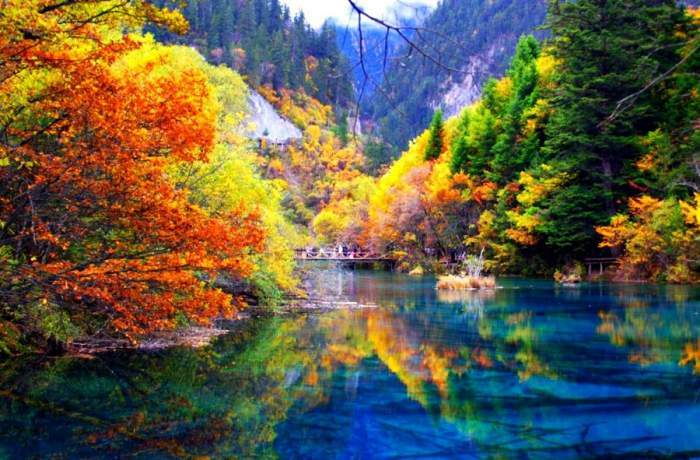 The five-flower lake is acknowledged as the pride in Northern Sichuan of China which is “Jiuzhaigou national park”. Jiuzhaigou national park is house to 108 different colors of lakes and the five-flower lake look is amongst the most colorful and the beautiful one. This shallow lake reflects various colors, including azure blue, dark green and light yellow. The magical shade of five-flower Lake furthermore contributes to the mineral deposit, algae, and aquatic plants. You will see many ancient trees blossoming through the clear crystal clear water of five flowering lakes. During the fall, the color of the surrounding forest turns yellow, light orange and red. It makes eye-catching views in Jiuzhaigou National Park. Nearby Attractions: Rize Valley, Pearl Waterfall, Nuorilang Waterfall, Shuzheng Valley. 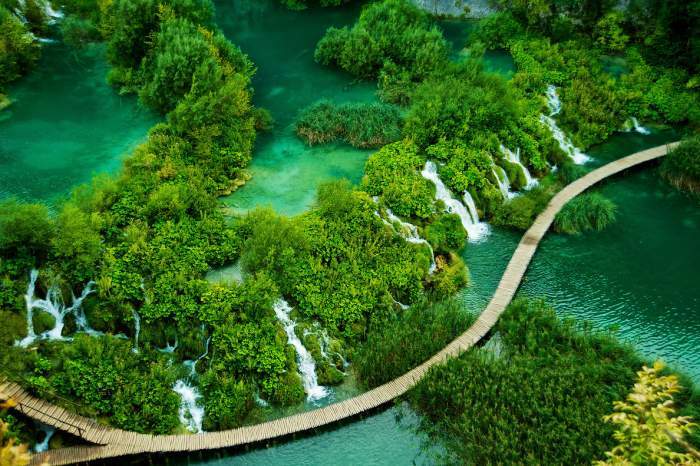 The Plitvice Lake marks its importance in world heritage site. It’s the most popular national park which is a great attraction for tourist of Croatia. This incredible park is diversified in woodlands, lakes, caves, and waterfalls in a large area of 300 square kilometers. The credit of formation of dams goes to the deposition of minerals that separate the lakes and this process still continues. Out of 20 amazing lakes, 16 of them are interconnected by a series of waterfalls. more than that, the mixing of mineral contributes to brilliant turquoise coloration to the lakes of the Plitvice national park. You’ll be surprised by the fact that the color of the lakes changes in accordance with the number of minerals in the water. It’s amongst the most beautiful lakes in the world. This national park gives shelter to a wolf, European brown bear, eagle owl, and 126 different species of birds. During the winter season, the lakes and waterfalls get frozen up. Nearby Attractions: The Upper Lakes, Sastavci, The Lower Lakes, Veliki Slap, Veliki Prstavac, Gradinsko Lake, Ranch Terra, Baraceve Spilje. Located in Cephalonia Island, the Melissani cave Lake in Greece is undoubtedly one of the most beautiful natural wonders that nature has offered. The formation of Melissani cave is owing to the dissolution of rocks and water enters into the cavities. The not stopping action of water over rocks results in the formation of hollows and underground lake millions of years ago. The Melissani cave lake includes both sea and freshwater and is having a depth of 20-30 meters. You will see a large opening in the roof of Melissani Cave. At noontime, the reflection of direct Sunlight in the turquoise waters create a magical brightness in the whole cave. It’s one of the most amazing cave lakes you’ll witness. This cake lake has many stalactite formations (formation of mineral deposits of calcium carbonate or other minerals; shapes similar to ice structure which hangs from the roof of the cave) inside the Melissani cave. Nearby Attractions: Casa-Museo, Karavomilos Lake, Donkey Trekking Kefalonia, Port of Sami, Agia Paraskevi Beach, Kefalonia Wine Tour, Kefalonia Cruise Lady O, Antisamos Beach, Drogarati Cave. 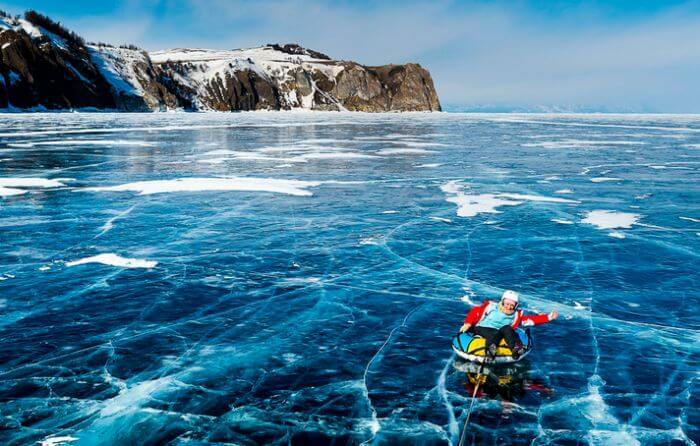 Located in South-eastern Siberia, The stunning Baikal Lake is the oldest and deepest freshwater lake in the world. It was around 25-30 million years ago when this lake was formed, having a depth of 1.6 kilometers. The crescent-shaped lake is covering more than 636 kilometers from North to South and contains 20% of world’s unfrozen fresh water. 2500 species of animals and 100 species of plants are the inhabitants of Lake Baikal. Most of these bizarre freshwater faunas are found only at Lake Baikal. UNESCO, In 1996 declared Lake Baikal as a world heritage site. Lake Baikal is also surrounded by mountains, boreal forests, tundra, and Islands. It’s one of the most incredible lakes you’ll ever see! Nearby Attractions: Irkutsk city, Listvyanka village, The Great Baikal Trail, Circum-Baikal Railroad, Arshan village, Peschanaya Bay, Olkhon Island, Ogoy Island. Located at a height of 1860 meters in the Canadian Rockies, the heart-stopping beautiful Peyto Lake shines at its best. Peyto Lake is a part of Banff national park, the oldest national park in Canada. The water of this glacier-fed lake has a bright turquoise color. The lakes get its lake color from mixing of rock flour in water that flows from Peyto glacier. Nearby Attractions: Icefields Parkway, Bow Lake, Helen Lake Trail, Visit Lake Louise, Discover Drumheller. This spectacular lake is touching all heights of beauty with deep shades of lavender (which is purple in color) at sunrise and salmon (red-yellow or orange) at sunset that it’s almost unbelievable and jaw-dropping. Nearby Attractions: Nordenskjold Lake, W-Trail, lacier Grey. 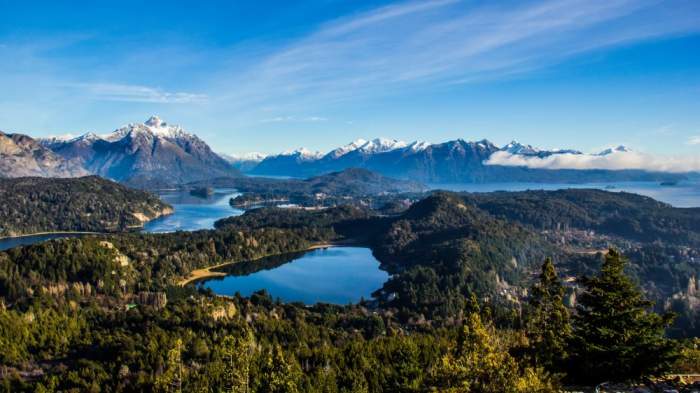 Nahuel Huapi settles on the foothills of Lake Andes in northern Patagonia of Argentina. In Argentina, Lake is the part of the oldest National Park, Nahuel Huapi National Park, which was established in 1934. 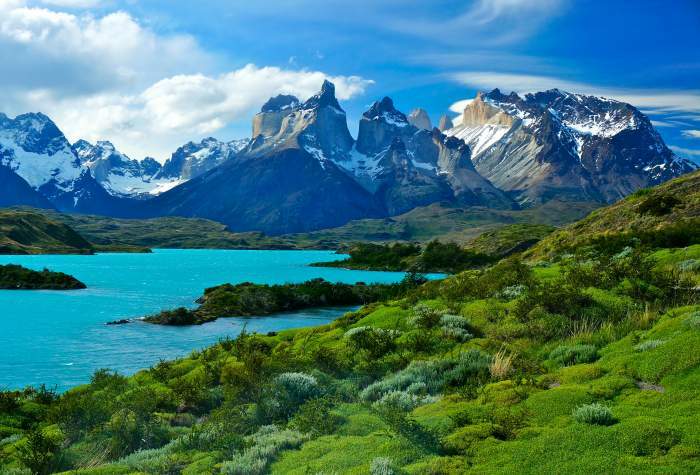 The lake is fenced with beautiful mountains, creating one of the most beautiful landscapes in South America, consisting of inlets, caves, beaches, thrilling cliffs, and wooded peninsulas. Nearby Attractions: T-Bar Paseos Lacustres, Alma Sur Eco-trips, Velero Impaciente, Cardinal Sur – Navegacion & Aventura. 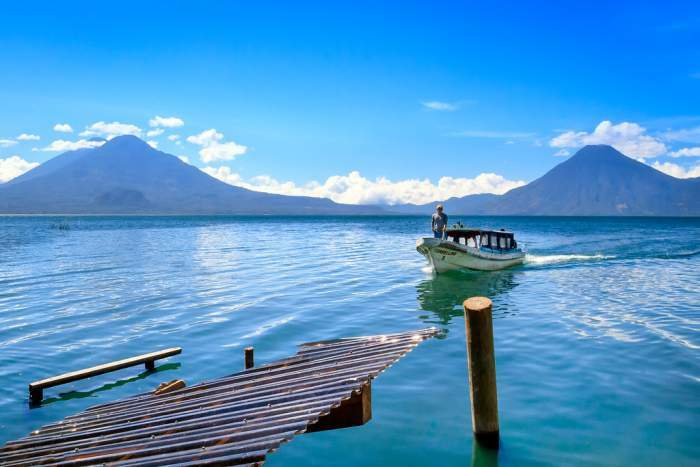 Guatemala city is having the blessing of this magical body of water in the highlands of the town, surrounded by three volcanoes and many native home villages of the house. The lake attracts the visitors with its intense volcano ancestry (it is a hole that is filled with water for more than 84,000 years ago) with a calm and peaceful environment. Nearby Attractions: Iximche, Volcan San Pedro, Indian Nose, Hotel Atitlan Gardens, San Antonio Palopo, Cerro Tzankujil Nature Reserve. 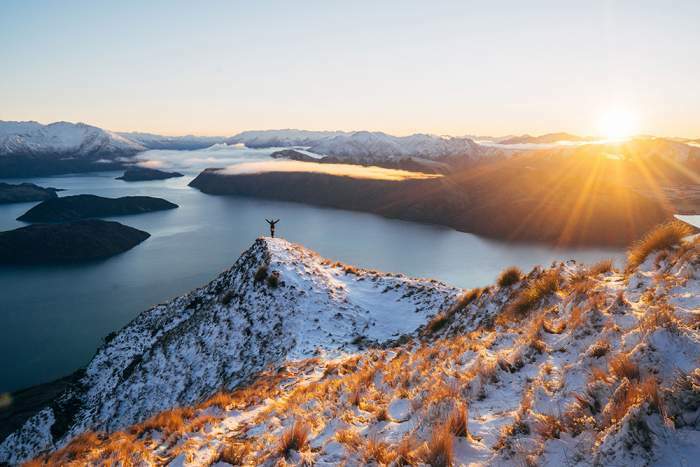 New Zealand finds its spot amongst the most beautiful countries in the world and regarded the source of pride for many incredible lakes. Lake Wanaka is one of those lakes, located on the South Island in the Otago region, at a height of 300 meters (984 feet). Matukituki and Makarora Rivers is the source of this lake. It was formed 10,000 years ago by glacial erosion. It’s one of the world’s most beautiful lakes. Nearby Attractions: Roys Peak Track, Blue Pools Track, Mount Iron Track, Snow Farm, Diamond Lake & Rocky Mountain walks, Mount Aspiring National Park. Next articleCelebrity Holiday Destinations Where Your Favorite Stars Loves Vacaying!